After the kids and I had the flu for about a week earlier last month, I needed to get the bathroom floors cleaned. I was not feeling up to going to store for more supplies. (See how I made my own homemade toilet bowl cleaner.) I needed something to clean the floors so I made my own. This homemade mopping solution was easy to fix up and left me feeling much better. The scent is very uplifting and I ended up getting a lot of stuff done around the house that day. The best part of this is that is an air dry recipe. You do not need to rinse your floor to clean up any residue. 10-15 drops of Lemon Essential Oil – Lemon cleanses and purifies the air and surfaces. 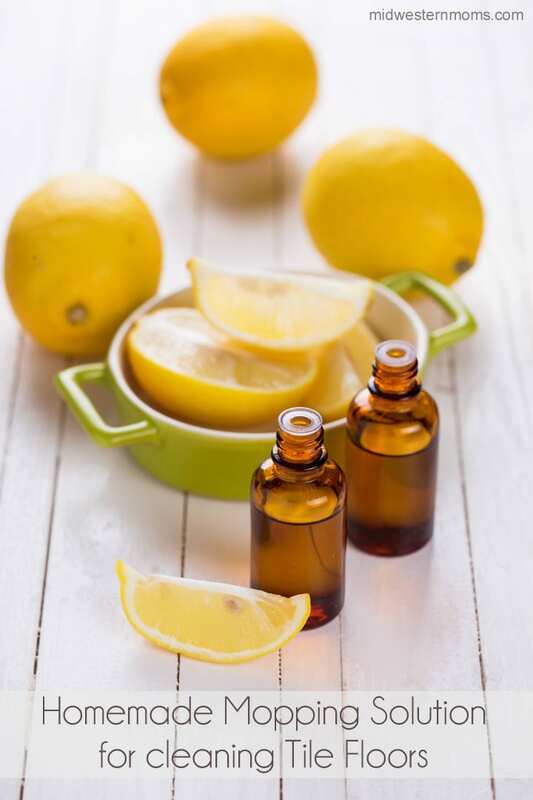 After filling up your bucket with warm water, add your vinegar and lemon essential oil. Use your mop to stir the solution and start mopping your floors. Don’t worry about the vinegar smell being overpowering, the lemon will take care of that. You will not smell the vinegar at all. I will warn you again, the pleasant lemon smell may result in you wanting to get more done on your to-do list. If you want to know where I purchased my essential oils or if you want to learn how to get your essential oils at wholesale cost, please contact me. Thank you for sharing! This would be so much less expensive than buying cleaners from the store. Plus I love that you don’t have to rinse! Do you think this would work on wood floors too? Should work as well for wood floors. This recipe is for a mop and bucket type mopping so if you use a mop that sprays the cleaner, you will need to adjust. I simply can’t understand WHY we can’t print and of these solutions out without wasting 17 pages of paper. This is a total turn off! you mean we have to run to the computer to find out a process for cleaning floors etc. wouldn’t it be nice to have a print friendly version?? I am sorry that my post is not written in a format that you wish. When I come across things similar on other blogs, I simply write it down and go on. OR, you could grab a pen and a cheap notebook and write the recipes down…..
Vinegar and lemon smell so clean and just makes the whole house feel homey when done. You always have such great ideas. i am always on the look out for natural homemade cleaning products! Thanks for sharing yours. Lemon is one of my Favorite scents and I look forward to trying this one! I’ve been looking for an all natural cleaning recipe because I want to avoid using chemicals. Thanks for sharing this! This is a great idea for tile floors! We have tile floors in our bathrooms, and I’ll have to give this a try. I love lemon essential oil! I love the smell of lemon essential oil! I’m making this solution up as soon as I get some. I heard about this but never actually tried. I will have to now. Hi Devon, thank you for sharing this mopping solution with natural ingredients. Found your post on Link Party Palooza. Thanks for sharing your recipe – I’ve been searching for something different to use in my kitchen. Will have to give this one a shot! This is great, you don’t need to buy expensive products to clean, but you can make your own mapping solution. Its very simple and easy to make. I really like it. What size bucket do you use? I have a 2 gallon size and wasn’t sure if I should double amounts or not.